Shabbat is a day of celebration as well as prayer. It is customary to eat three festive meals: Dinner on Shabbat eve (Friday night), lunch on Shabbat day (Saturday), and a third meal, known as Seudah Shilshit, in the late afternoon (Saturday). 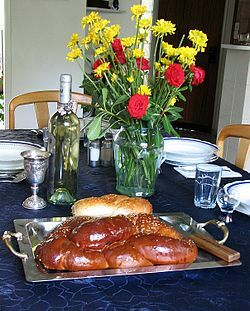 This is a typical table setting for Jews during Shabbat. On Shabbat Jews recall the Biblical Creation account in Genesis, describing God creating the Heavens and the Earth in six days and resting on the seventh. It also recalls the giving of the Torah at Mount Sinai, when God commanded the Israelite nation to observe the seventh day and keep it holy. Shabbat is considered a festive day, when a Jew is freed from the regular labors of everyday life, can contemplate the spiritual aspects of life, and can spend time with family. Traditionally, three festive meals are eaten: on Friday night, Saturday morning, and late Saturday afternoon. The day is also noted for those activities prohibited on Shabbat according to halakha (Jewish law). The word Shabbat derives from the Hebrew verb shavat. Although frequently translated as "rest" (noun or verb), another accurate translation of these words is "ceasing [from work]", as resting is not necessarily denoted. The related modern Hebrew word shevita, (labor strike), has the same implication of active rather than passive abstinence from work. The notion of active cessation from labor is also regarded as more consistent with an omnipotent God's activity on the seventh day of Creation according to Genesis. Okay, so you get the point. The Jewish Shabbat is a little different then ours. But the purpose is the same; to honor God by setting aside a day completely for Him; to honor and serve Him; to serve each other, and to rest. Hope you enjoyed this. I thought it was interesting that the Jewish Sabbath starts on Friday evening, and ends on Saturday. What are your favorite things about the Day of Worship? I really enjoy spending time with the Family of God, learning about Him and in general fellowshiping with the body of Christ. Yeah, fellowshipping with others is always so enjoyable, especially when in a Christian a atmosphere. Thanks for commenting! I too am going to write about Sunday soon. Great post. Thanks! I really like yours too about the Victorian Lifestyle. Very fascinating. And your choice of books is pretty spot on too. Thank-you so much for sharing about this! Although I attend an advent Christian church, my dad's whole side of the family is Jewish. I find it sad how some Christians do not show respect at all for Jewish tradtions, when truly, they worship the same God as us! And they should be worshipping and resting on the same day as the ten commandments are for everyone not just the Jews. If our Lord Yeshua went the to the synagogues on the Sabbath shouldn't we too as Christians? Praise Yahshua for salvation and the Sabbath!